At Supriya Aesthetic Dermatology, the Profound® non-surgical facelift is one of the most effective treatments for skin volumizing and lifting of the face and neck for patients in West Palm Beach, Jupiter, and the rest of South Florida. What is the Profound® Non-Surgical Facelift? Profound® is a thermal energy-based facial treatment that dramatically improves laxity in aging facial and neck skin. This non-surgical facelift procedure uses thermally regulated and fractionated radiofrequency controlled needles, which are inserted into the patient’s problem areas to induce lifting and tightening of the skin. Unlike other non-surgical facelift procedures, such as Ultherapy®, Profound® not only tightens and lifts lax skin, but it also produces hyaluronic acid, collagen and elastin to add much-needed volume to thin areas of aging skin. The Profound® device was manufactured by one of the leading brands in laser cosmetics, Syneron Candela®, and this cutting-edge device represents a revolutionary development in non-surgical facelift techniques and procedures. Profound® is an outpatient procedure performed under local anesthesia, and it does not involve surgical incisions. 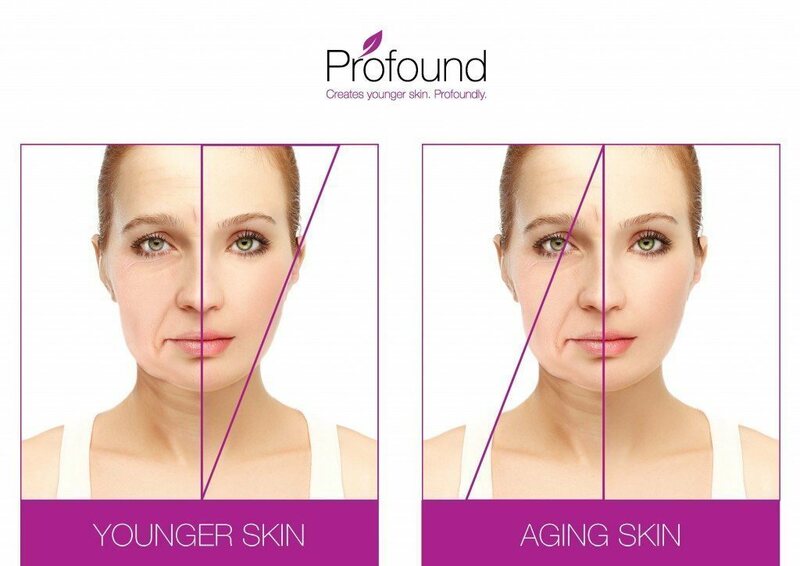 Profound® has one of the highest satisfaction rates among non-surgical facelift and non-surgical skin tightening patients for its ability to dramatically improve aging skin with consistent results. How is the Profound® Non-Surgical Facelift performed? Patients who desire smooth and firm skin without surgery turn to Supriya Aesthetic Dermatology because Dr. Tomar is renowned for her non-surgical and non-excisional facelift and skin tightening techniques. Dr. Tomar gently numbs the treatment area with local anesthesia, making the Profound® Non-Surgical Facelift a virtually painless procedure. Dr. Tomar uses Profound® to lift and tighten many areas of the face, including the cheeks, and even the neck and jaw line. Profound® has proven effective for not only tightening areas of the face and neck but the procedure has also shown promise for tightening loose skin across the body. Once the treatment area has been thoroughly numbed with a local anesthetic, Dr. Tomar will insert five high-tech pairs of silicone-coated micro-needles under the skin. The needles are so small that they do not cause any pain or bleeding during the procedure. Each of the 12 microneedles has an uncoated tip that sends radio frequency (RF) electrical current back and forth between the other tips. The end of the micro-needle that’s inserted into the skin is coated with silicone to protect the skin’s surface from thermal burns and/or damage. The RF energy then oscillates back and forth between the microneedle tips, releasing heat into the surrounding tissues at a precise depth and temperature. This thermal energy stimulates the formation of new collagen and elastin fibers, which tightens and lifts loose, sagging skin. Each thermal injection micro-needle delivers a precise, four-second pulse of thermal energy at 67 degrees Celsius deep below the skin’s surface. High-tech thermal couplers embedded within each silicone-coated micro-needle prevents the temperature from going above or below the 67-degree threshold. Clinical research has shown that delivering thermal energy at 67 degrees Celsius for four seconds is the ideal temperature and duration to stimulate the production of the type of elastin fibers that coil and recoil and the type of collagen that lifts and tightens the skin for optimal results. Profound® is a computer-controlled procedure that enables Dr. Tomar to lift and tighten the skin with increased precision. Each area of lax cheek and neck skin takes between 30 to 40 minutes to lift, tighten, and complete the procedure. Who is a candidate for the Profound® Non-Surgical Facelift? If you’re experiencing mild to moderate skin laxity of the face or body, you’re a likely candidate for the Profound® Non-Surgical Facelift procedure. Most of our patients are interested in Profound® because they want to address skin laxity and achieve optimal results without an invasive surgical procedure. However, the best candidates have realistic expectations in regards to what Profound® can achieve, and they should have three to five days set aside for the associated downtime of this procedure. Patients who desire more extensive results, such as those achieved through more invasive, surgical procedures, and those who have unrealistic expectations of non-surgical treatments such as Profound®, are not likely candidates for this procedure. People who have undergone previous adjunctive procedures, such as intense pulsed light (IPL®) photofacials, transepidermal fractional resurfacing, and radio-frequency treatments, are also good candidates for the Profound® Non-Surgical skin tightening procedure. How long does a Profound® Non-Surgical Facelift technique take? The areas that Dr. Tomar treats with Profound®, also known as zones, include the neck and cheeks, and some areas of the body that exhibit skin laxity. Treatment time for each zone totals 20 minutes. Therefore, Dr. Tomar can address the cheeks, jowls, and neck in no more than one hour and 30 minutes. The Profound® non-surgical facelift uses a slow, methodical, yet precise process to add volume and tone to the skin via the production of elastin and collagen fibers and hyaluronic acid–the building blocks of smooth, elastic skin. The procedure does have its side effects, such as mild to moderate swelling, and patients should take time off from work and their normal daily routine to recover. Patients respond differently to thermal stimulation, and the amount of swelling following the procedure varies from patient to patient. In general, most non-surgical facelift patients resume their normal daily routine and work schedule within three to five days of treatment. How long is recovery from the Profound® Non-Surgical Facelift? Due to the noninvasive nature of the Profound® Non-Surgical Facelift, there is often little pain and discomfort associated with the procedure. However, patients may experience swelling and fluid accumulation in the treatment area for up to three to five days following the procedure. Additionally, the areas where the microneedles were inserted may leave a needle-sized scab, which should peel away within three to five days. Most of our Profound® patients can look relatively good in makeup and resume their work and/or social schedules within three to five days after the procedure. Some of our patients have even blamed their appearance on dental procedures, such as gum surgery, or allergic reactions to certain foods if swelling remains beyond the typical three to five-day period. All swelling should go away within seven to 10 days of the procedure. The collagen and elastin remodeling process will continue to take place deep below the skin’s surface over the course of four to six weeks. By week six of the Profound® non-surgical facelift and over the course of a three-month period, patients should notice a gradual firming, tightening, and volumizing effect across the treatment area–all without the pain, surgical scars, and disadvantages of open surgical procedures. What kind of results can I expect following a Profound® Non-Surgical Facelift? The Profound® Non-Surgical Facelift delivers an outcome that is in line with the desired results of most patients, which is mild to moderate tightening of the skin with a subtle, yet noticeable volumizing effect. All patients can expect some degree of tightening in the treatment area due to the extreme thermal temperature and duration of pulses during the procedure. However, the degree of lifting and tightening depends on the severity of each patient’s skin laxity and loss of volume, but over six peer-reviewed studies have resulted in a 100% response rate and extremely high satisfaction rates among all patients treated. With optimal settings, clinical studies suggest that Profound® can produce up to 50% of the tightening and volumizing results of similar surgical procedures. Patients can increase the efficacy of Profound® and prolong their results with other nonsurgical treatments, such as IPL® (Intense Pulsed Light) photofacials, topical energy-based wrinkle treatments, and Fraxel®; all of which can be performed concurrently with the Profound® Non-Surgical Facelift. Injectable cosmetics such as Botox®, Kybella™ , and fillers such as Juvederm Voluma™ XC can also be performed at the same time as the Profound® Non-Surgical Facelift to enhance its efficacy and prolong the results. How long will my results last following my Profound® Non-Surgical Facelift technique? The results patients experience from the Profound® Non-Surgical Facelift and skin tightening procedure will last them for a number of years. The elastin, collagen, and hyaluronic acid produced by the procedure are natural, but they will gradually degrade over time. The older a patient is at the time of treatment, the shorter they can expect their results to last. Smoking, sun exposure, weight fluctuations, and how you care for your skin will also affect the results of a non-surgical skin tightening and facelift procedure. We also recommend other nonsurgical, maintenance treatments following Profound® to help our patients prolong the tightening and lifting effects of the procedure for many years. These maintenance treatments are offered to all patients who undergo the Profound® Non-Surgical Facelift and skin tightening procedure. If you are interested in a consultation, please contact us at 561-805-9399 to make an appointment.